Esta casa é uma bela casa fila final da unidade no altamente procurado área de Capitol Hill. Há estacionamento gratuito na rua na parte traseira de nossa casa para 2-3 carros, que é muito raro em DC. Temos também um sofá-cama queen size para dormir 2 pessoas adicionais na sala de estar que podem ser divididas com as restantes portas de bolso histórico para criar uma sala privada durante a noite. Você está a menos de 1,6 km do Eastern Market, do Union Market, da Union Station, do H Street Corridor (um dos melhores bairros da moda da América pela Forbes) e muito mais. Basta estacionar o seu carro quando fizer o check-in e deixá-lo até a hora de ir. Mais de uma dúzia de bares / restaurantes dentro de 0. 4 milhas. Nós só pedimos que você se abstenha de festas barulhentas. A propriedade é uma unidade multifamiliar e Ashley e eu moro na unidade completamente separada abaixo. Nosso bairro é extremamente amigável e um lugar tão bonito para se viver. Nós absolutamente apreciar a proximidade de tantas atrações nas proximidades. O tamanho e a localização tornam a nossa casa tão desejável. Uma unidade final com toneladas de luz natural e uma grande planta torna um ótimo lugar para desfrutar com sua família. Estamos disponíveis conforme necessário. Nossos convidados estão de férias, então deixamos que eles façam exatamente isso. Aproveite as suas férias. O bairro de Capitol Hill tem 59 parques no centro da cidade. Esses triângulos e quadrados foram projetados por Pierre L'Enfant, o designer urbano nascido na França que projetou o plano básico para Washington, DC. Os parques proporcionam um espaço verde urbano, proporcionando aos residentes e visitantes um local agradável para desfrutar do ar livre. Vernon was a wonderful host. He was very helpful in answering questions before our stay regarding check - in procedures. Vernon's home was the perfect setting for our large combined family of seven! The house was impeccably clean and welcomed us with the amenities of home; coffee, cooking essentials, and the softest most comfortable beds! The check in/check out procedures were very easy as well. We loved the location of the property; within walking distance to the grocery store, coffee shops, and metro. It was a great place for the cousins to visit and enjoy each other's company! I would highly recommend staying in Vernon and Ashley's beautiful and comfortable home! We had an amazing trip to DC, and the home was fantastic. The space was perfect for our family of 5, and I cannot recommend it enough. Thank you so much for staying with us Jessyca. It was a pleasure to have you all in DC. You're more than welcome to stay with us again. Perfect property and location for a DC sightseeing visit. Our group is a family of six. Vernon's property was the perfect size and location for our visit for sightseeing DC. This is a welcoming property with lots of room for up to eight. On site parking is a great amenity. Surrounding neighborhood is safe and filled with everything you will need for a great visit. Vernon is a great guy and even better property owner. We had one small issue the first day. Vernon solved the problem during the day while we were seeing the sights. I wouldn't hesitate to stay here again. FYI- be aware of the DC Circulator bus service. Great transportation and cheap. We (three couples) loved both the property & the location. We arrived by car, 4 of us from NC & 2 from CT. Having on site parking made it very convenient for us. During our 4 day stay, we looked forward each afternoon to returning to a very comfortable home for some rest & wine before dinner. The location was perfect for the activities we were interested in. 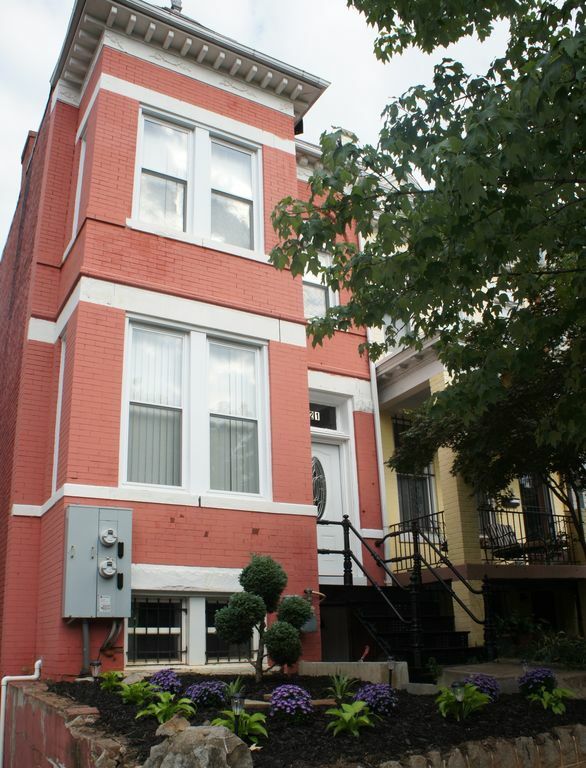 Easy walking distance to the Capital, Supreme Court, Library of Congress, etc. And when we didn't want to walk, UBER was at our door. Vernon was a pleasure to deal with. If we had a question or issue in the house, it was answered or solved immediately. We would certainly come back for a future DC visit & recommend it to or friends. Great house. Neighborhood felt safe. Would recommend this to any one staying in the DC area. Right at a mile to a lot of attractions including Union Station. If you’ve never been to DC check out the circulator bus line. Perfect place to stay for eight women in their mid 40s celebrating our “girls weekend“. Plenty of room for all eight of us and beautiful as well. Perfect location within walking distance or an easy Uber ride to anything. The Whole Foods store only a couple of blocks away. The owner was very helpful to our needs, including telling us of a great bakery for a small baby shower we were holding for one of our ladies. Would highly recommend and hope to come back ourselves!